My friend, Tina, and her boyfriend, Tom, both had their birthdays during the same weekend, but they each needed their own cake. 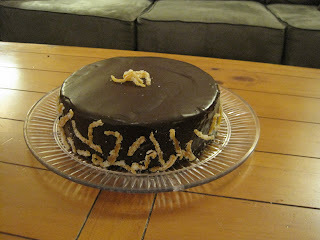 Tina wanted hers to be an orange dream cake with chocolate filling and chocolate ganache on the outside. I have to say, it turned out pretty yummy. Good flavor choice, Tina. 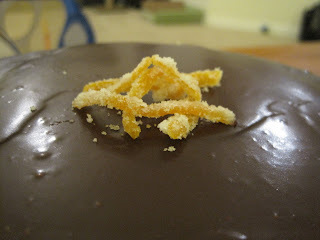 Of course I had to add a little flair with my homemade candied orange peel for garnish. So, once Tina's cake was all gone (which didn't take too long at all), it was time to move on to Tom's. 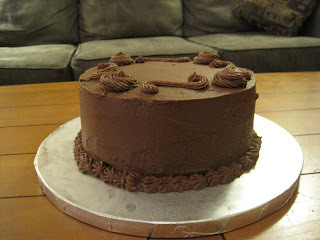 It's been so long since I actually made the cake that I can't quite remember exactly what the flavors were. How sad is that??? 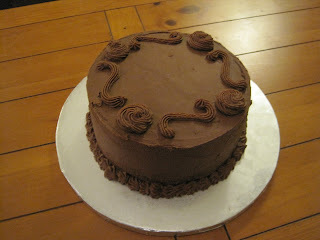 I think they were my homemade chocolate cake with chocolate buttercream. I didn't actually try any of this cake, but from what I understand, Tom was pleased. That's all I can ask for.